Chicago Open Air is throwing a special pop-up party TODAY at the brand-new location of Kuma's Corner (852 W. Fulton Market), where the official Chicago Open Air Burger will be available for one day only. It features a 10-ounce beef patty with raspberry jalapeno jam, cheddar cheese, applewood smoked bacon, crispy potato strings, deep-fried chorizo and cream cheese-stuffed breaded jalapeno. No service fee tickets for Chicago Open Air will be available for purchase here and at the other Chicago-area Kuma's Corners locations until the weekend of the festival. The Chicago Open Air music lineup leads off with a rare U.S. festival appearance from rock legends KISS (headlining Friday) as well as one of the first solo performances from Ozzy Osbourne (headlining Sunday) since the final Black Sabbath tour, where he will reunite with guitarist Zakk Wylde after a decade apart. Rock heavyweights Korn will headline Saturday. 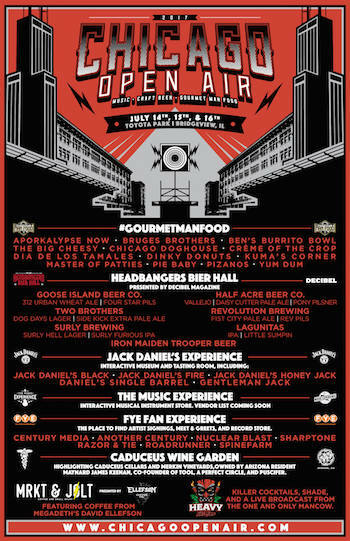 Overall, the three-day music, craft beer and Gourmet Man Food festival will feature over 40 music performances, also including Rob Zombie, Slayer, Godsmack, Megadeth, Stone Sour, Seether, Anthrax, Lamb of God, Meshuggah, Amon Amarth and many more on the Main Stage and the BlackCraft Stage. SiriusXM's Jose Mangin returns to host the weekend and introduce acts. General Admission and VIP tickets are on sale now at www.ChicagoOpenAir.com and at all Chicago-area Kuma's Corner locations. Danny Wimmer Presents will be throwing the official Chicago Open Air Kickoff Dinner, held at Kuma's Corner (2900 W. Belmont) on Thursday, July 13 at 7 p.m. For $50, attendees will be treated to burgers, appetizers and beer, and will have the chance to hang out with host Jose Mangin, from SiriusXM's Liquid Metal. A limited quantity of only 100 tickets will be available at www.ChicagoOpenAir.com. Stop by the Monster viewing deck to refuel and meet some of your favorite Chicago Open Air artists! Monster Energy will be keeping fans fueled up and ready to rock by offering free sampling on their Monster Energy viewing deck. Enjoy Monster Energy drinks from one of the best seats in the house. Make sure to check back throughout the festival for a schedule of Monster Energy's interactive artist experiences. Most companies spend their money on ad agencies, TV commercials, radio spots and billboards to tell you how good their products are. At Monster Energy, we chose none of the above. Instead we support the scene, our bands, our athletes and our fans. We back athletes so they can make a career out of their passion. We promote concert tours, so our favorite bands can visit your hometown. We celebrate with our fans and riders by throwing parties and making the coolest events we can think of a reality. Illinois' largest craft brewery is brewed right in the heart of Chicago. Started as a brewpub in Logan Square in 2010, Revolution added to its growth with the 2012 opening of its production facility in the Avondale neighborhood, just a short distance from the brewpub. Revolution offers dozens of different beer styles to craft beer fans through stores, its brewpub, and its taproom located at the brewery. Revolution focuses on brewing the highest quality beer as displayed in its popular brews such as Anti-Hero IPA and Fist City, a Chicago pale ale. Rev Brew has tripled its brewing capacity over the past year and sells its beer in seven states including Illinois, Indiana, Ohio, Massachusetts, New York, New Jersey and Wisconsin. The Music Experience features all things a musician needs to ROCK OUT! The interactive exhibit features your chance to test out your inner Rock Star with guitars, basses, amps, drums, keyboards and electronic gear that are used by today's most popular bands. After laying your hands on the hottest equipment available, you will walk away feeling like a rock star! Find a full list of exhibitors coming soon. 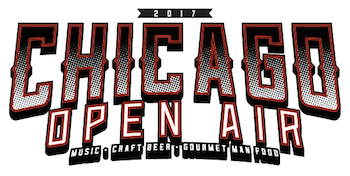 The premier roasts from Megadeth's David Ellefson will be available onsite at Chicago Open Air exclusively at this special fan meetup spot. Ellefson opened his first coffeeshop in his hometown of Jackson, Minnesota in February 2017 and offers various blends including Roast in Peace, Kenya Thrash, She Wolf and Urban Legend. Fans might even see the bassist-turned-barista serving them coffee! The dark side of Tiki is through the totems where savages and beasts enjoy Scorpion Bowls and Zombie cocktails—all in the name of tropical leisure. The Tiki Gods are looking for a good time and they have come to Chicago Open Air to find it! At the Heavy Tiki Bar, fans will find an oasis filled with killer cocktails, shade, and a live broadcast from the one and only Mancow, the legendary radio personality from Chicago's WLUP. Kuma's Corner will be returning to serve their signature metal themed burgers. The premier metal magazine is turning 30 years old in 2017 and will be celebrating all weekend long at Chicago Open Air. Stay tuned to Metal Hammer's website and social media pages for more details. We are proud to announce The BlackCraft Stage as the second stage at Chicago Open Air. Beez from "That's Not Metal" will also be interviewing artists backstage for BlackCraft all weekend. Set times and performing artists will be announced at the end of June. During Chicago Open Air, make sure to visit the BlackCraft apparel shop next to the stage. It's the only place to purchase BlackCraft merchandise over the weekend. FYE is the ONLY place to score your favorite Chicago Open Air artists' latest CDs and Vinyl at the festival and even get a chance to get them signed! Participating labels include Roadrunner, Century Media, Another Century, Nuclear Blast, SharpTone Records, Spinefarm and Razor & Tie Records. We will be hosting artist signings all weekend long — follow us on Facebook and Instagram for the latest signing schedules and special pop-up performances. Take Me Home (TMH) has been saving the lives of homeless animals since 2001. TMH was founded as an animal rights advocacy foundation saving orphaned animals and striving to end animal overpopulation. TMH works in conjunction with shelters and rescues throughout California and beyond to help save animals on death row, on the streets, or in unsafe living conditions. Stop by their booth for custom gear and to contribute to a great cause. Chicago Open Air sponsors include: Monster Energy, Jack Daniel's, FYE, Dyin 2 Live / Fxck Cancer, Take Me Home Animal Rescue, El Jimador Tequila, The Music Experience, Roadrunner Records, Century Media Records and more to be announced.